As the car eased out of the motel parking lot, a thought was nagging in the back of my brain. Was I wasting my time? Any contemporaries of my grandmother were long gone. Maybe too much time had passed. This whole quest had begun by happenstance. Opening a shop to sell my vintage collection was a conscious act to declutter. Naming the shop Madge’s Hatbox, after my grandmother was a loving gesture and a cute name. 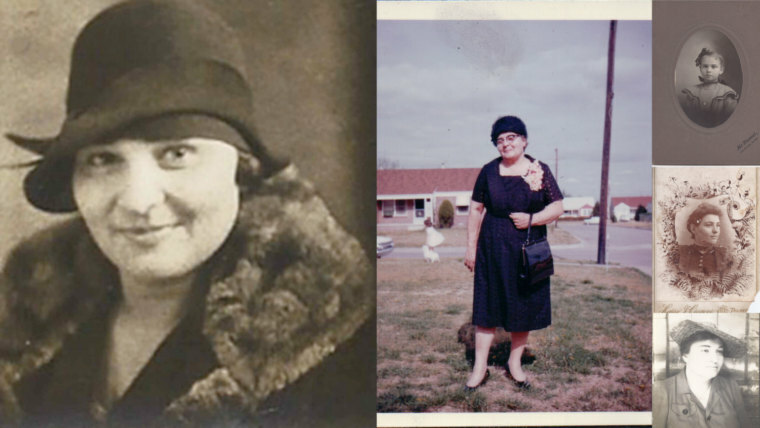 Then a chance remark by my aunt made me see my grandmother in a whole new light as a young career woman in the 1910s; filling me with a passion to learn more. Would the question of grandmother Madge’s hat shop in Scooba Mississippi ever be answered? I had two more chances to find out. First, the archives at Mississippi State and then the state archives in Jackson. 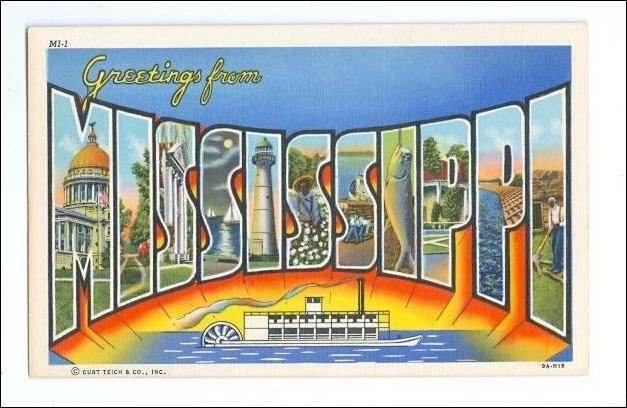 Eastern Mississippi is mostly farmland; green with rolling hills and the occasional small town. Starkville, the home of Mississippi State, is pretty much a straight shot north from Meridian, about an hour and a half away. On the way I stopped one more time to bid adieu to Scooba. She had given me all the answers she was going to give. 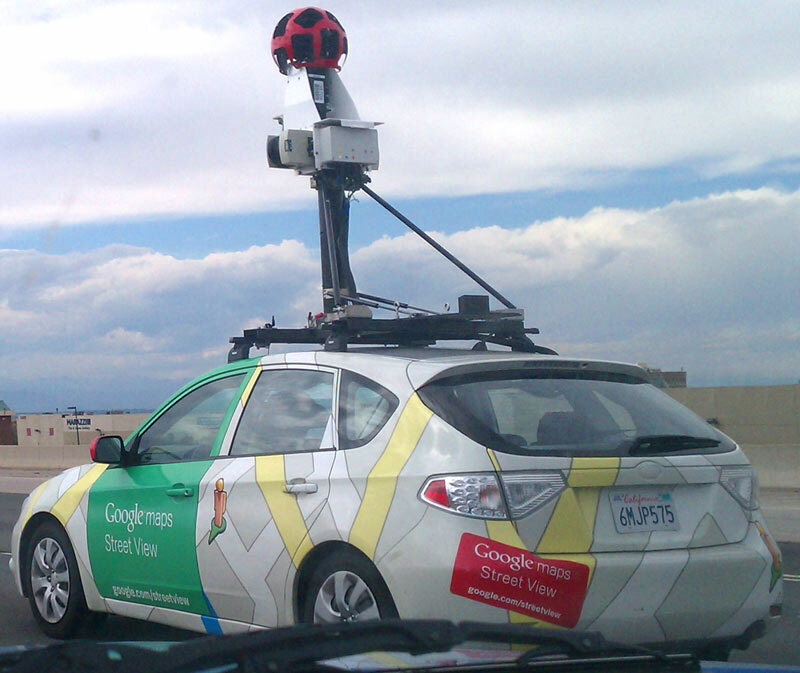 As I got closer to MSU, there was something very unusual plying the frontage road. It was a small, brightly painted car with a very tall tower on top and looking so out of proportion that a whiff of wind might knock it over. Pulling up even with it I could see it was a Google mapping car! Quite a jolt of the present since I was mentally rummaging around in 1917. Arriving at Mississippi State I spent a good 20 minutes trying to find the Mitchell Memorial Library. Then after another 10 minutes figuring out where to park I was finally in the hushed confines of the library and in heaven. I love libraries, the smell of books, the lack of nagging cellphones and the reverence for knowledge in the air. I headed upstairs to the Special Collections section for my appointment with Mattie, Assistant Professor and Coordinator, Manuscripts Division. A stack of boxes was waiting for me. There is a ritual for using special collections. Librarians don’t spend years archiving information and meticulously housing them in acid free paper just so you can get your grubby hands on them. After signing my life away and getting my pair of white gloves, I received instructions on the proper way to go through the boxes and mark what I wanted copied. After a few false starts I was on a roll. Leafing through the through files of photos, personal correspondence I found a fascinating WPA treatise on Kemper County. WPA (Works Progress Administration) was one of the many agencies set up in the 1930s during the depression by President Franklin Roosevelt to create jobs. One of the projects of the WPA was to survey US counties. This one, on Kemper County, authored by Ona Johnson Boyd, was a historical, agricultural and mineral survey. Although the Boyd collection didn’t yield answers for me, it was fascinating to look through the box that held not only her finished survey but also all of her notes, most on small scraps of paper. Some notes were even written on the back other items, an indication of the lean times in which she worked. Moving on to the other boxes I found a small Scooba city directory with a list of property owners downtown. Of course Madge didn’t own anything, but it was another clue. 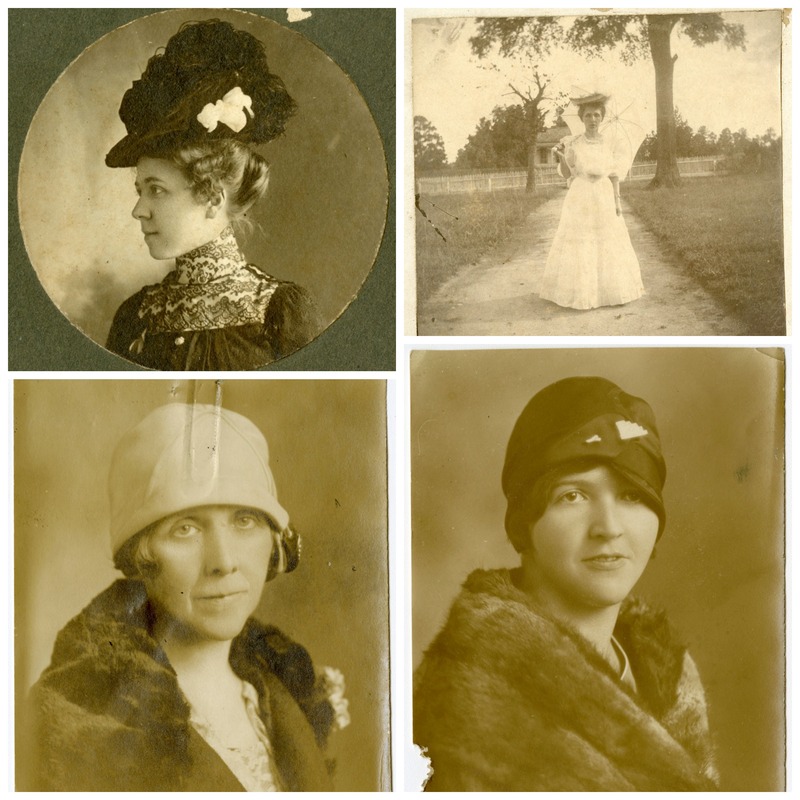 After several hours more of fruitless searching I didn’t find anything else except for these lovely photos of Kemper County ladies in some fabulous hats. I gathered up my meager finds and the staff cheerfully took my order and scanned everything. I owe a big thank you to Mattie and her staff at Special Collections. I headed back to the car and on to Jackson, three hours away. Tired from the long day, I eagerly checked into the downtown B&B I had booked, ready to relax. Unfortunately my room was far from tranquil with its bright purple wall and decorated in a style I can only call early bordello. Why on earth would I want to watch TV from a fainting couch? The lobby however, was very nice especially since they had set out some lovely white wine. There was also a fantastic roof deck. After driving for the most of the last three days I took advantage of the pleasant evening to walk around downtown. 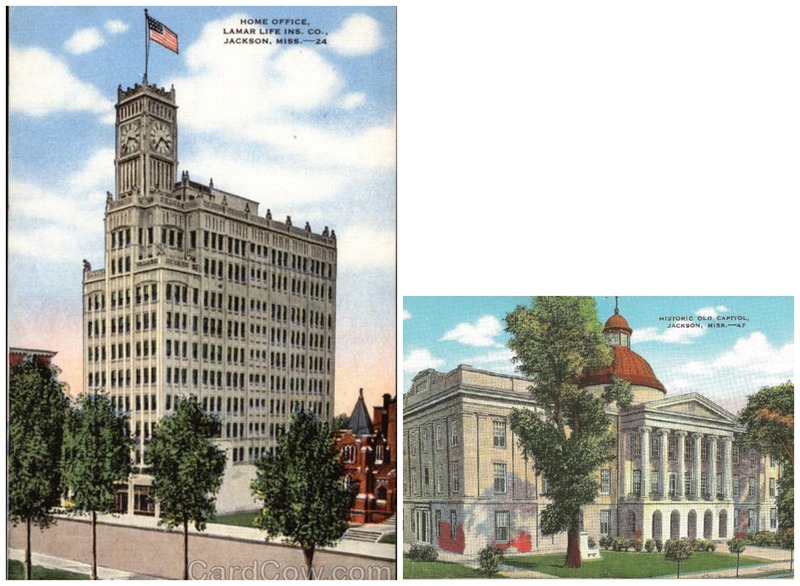 Jackson is the state capital and like Meridian, there are quite a few historic buildings with interesting architectural detail. The old Capitol building was just down the street from the B&B and another fabulous building right in the middle of downtown, Lamar Life. After googling the building I found that was the tallest building in the state when it opened in 1924. The vice president of the company at the time of the building’s construction, Christian Welty, was the father of one of my favorite writers, Eudora Welty. Walking further down the street, I found a fun taco joint and after a delicious dinner at Jaco’s Tacos and a couple of very large Margaritas (the beauty of walking to dinner) I settled back into my room. Tomorrow was do or die. The next morning I was raring to go. I had used up my cushion day and absolutely had to get to Dallas that night, a 400 mile drive. The State Archive Building is one of those imposing government buildings done in a mid-century modernist style. After signing my life away, again, I headed to the microfilm department. Since the last time I trudged through microfilm was for a college term paper back in 1979, I needed a little remedial education. The media librarian sat me down and showed me how to thread the microfilm through the reader, which I think was from 1979; move through newspaper issues and how to focus each page. After several additional remedial sessions on those very same subjects, I was set. Not knowing anything about the Kemper Star Herald I was a bit worried about how many issues I would have to review. Luckily the paper only published twice a month. Knowing Madge was there sometime in 1917 I started in 1916 and moved forward. The paper had a standard format. The front page had large ads; the next page usually included a “From Scooba” column and then a general interest and business page. I reviewed each issue, first checking the front-page ads, then reading each from Scooba column detailing the goings on of Mrs. So and So and the trips of the daughter of Mr. and Mrs. Hoi Polloi. Surely the arrival of a young milliner to opening a hat shop was worth a mention. After reading each column and reviewing the rest of the ads I moved on to the next issue. Now I want to find out more info on Miss Hopper. 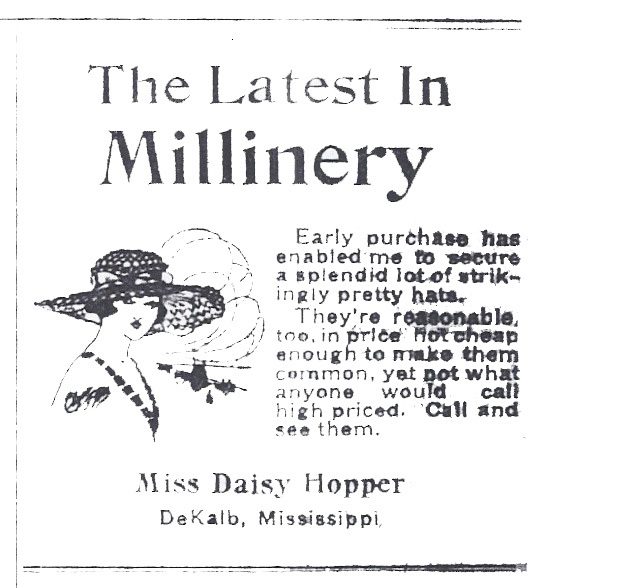 A milliner in DeKalb, Miss Daisy Hopper, was advertising about once a month. 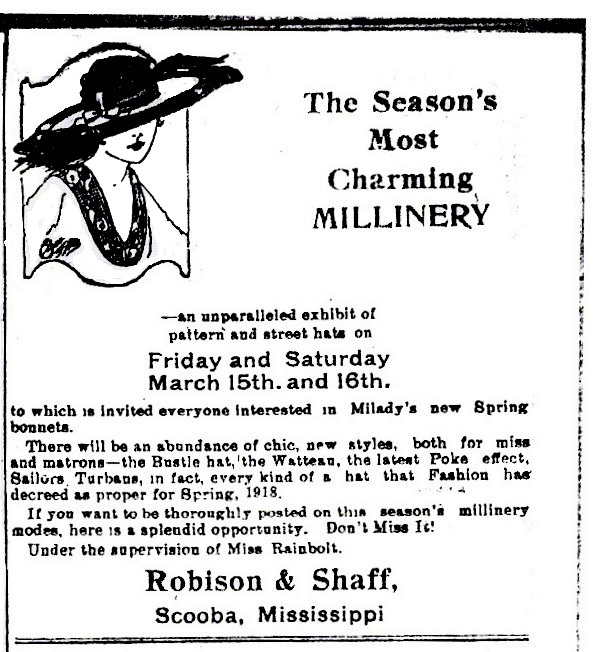 A prominent Scooba store, Robison and Shaff, was also advertising hats. I found their ads in the spring and fall issues announcing their seasonal collections. 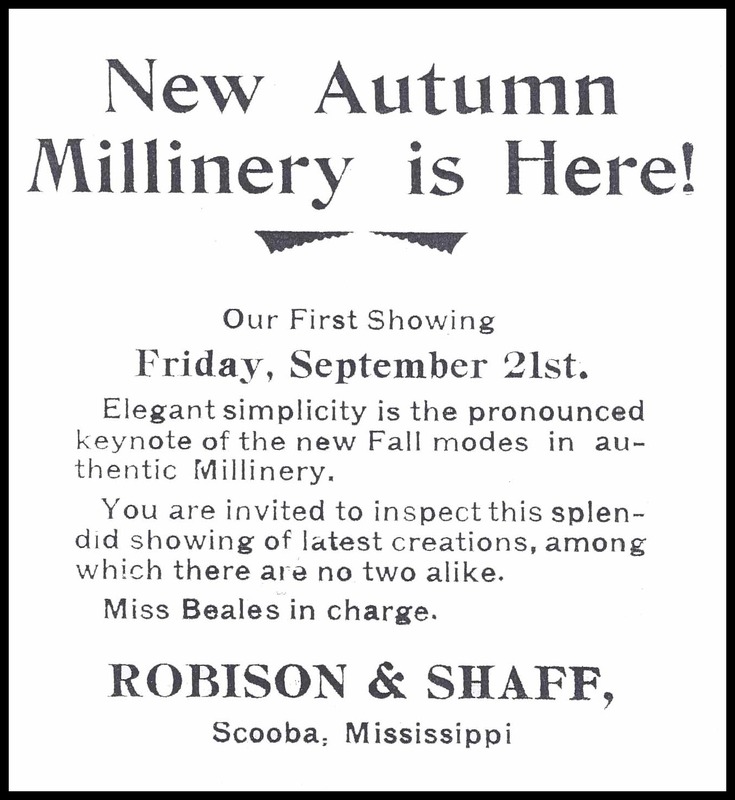 Some of the ads even mentioned the name of the woman who was the milliner. That name changed every season or so as new milliners cycled through the hat department. I imagine in a small town such as Scooba, it was important to find someone new from time to time to keep the local ladies buying. I was through 1916 and the first quarter of 1917 and my head hurt from reading all the blurry text. Microfilm for a newspaper that is almost 100 years old is almost impossible to read. Taking a break for a pleasant lunch back at the B&B, I once again sat down at the machine again and resumed my monotonous and so far fruitless search. It was getting close to 3:30 and that drive to Dallas was looking longer and later. I was into September and that sinking feeling of yesterday was coming back. I was tired, worried about that long drive and then suddenly there it was on September 26, 1917. New Autumn Millinery is Here – Miss Beals in charge. Of course they did spell her name wrong. All this time thinking that Madge had her own shop had put me on the wrong track. She didn’t have her own shop; she was one of the Robison-Shaff milliners. I stared at the ad dumbstruck. Joyful tears started to well up. After all this time and research there she was. My grandmother, and on the FRONT PAGE no less. Calming down, I noted the date and moved on. Miss Beals appeared in every ad that season. Some ads were on the front page and others were not, but her name was right there in every ad right up through December 19, 1917 and then the ads were gone. Based on the previous year I knew the ads would reappear some time in the spring. 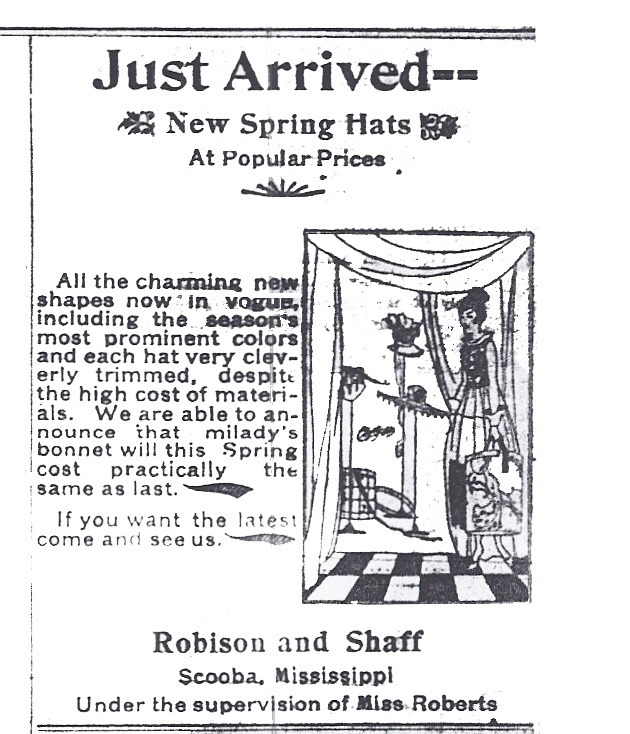 Sure enough on March 16, 1918 there was another ad, but now Robison & Shaff was “Under the supervision of Miss Rainbolt”. Madge was gone, lasting only three to six months. How long was she actually there? Why did she leave? Was she homesick? Or, did she leave on account of Mr. Shaff, a man who was quite vivid in Mae’s letters? I would probably never get those questions answered. But I’m laying my money on Mr. Shaff, who according to Mae was now wooing Miss Rainbolt. That rake had quite the set-up with a new young impressionable milliner coming to town every year or so. Well I could muse about that later. Right now I needed to get copies ordered and get out of there. The microfilm librarian directed me to the main desk to order the scans. I triumphantly marched over to the desk, where a smirky young man behind the counter announced that the scanner was broken and would probably not be replaced. As an aside, here’s an interesting fact I have learned about the South in the 30+ years of living here. Southern politicians make a lot of noise about their proud history, the confederacy, yada, yada yada, but it’s a false bravado. For when it comes to actually footing the bill for libraries, historic sites and the preservation of buildings there’s a whole lot of silence. Glancing at my watch it was nearing 4:00. The library closed at 4:30 and of course there was that little matter of getting to Dallas. Grumbling I headed back to microfilm and proceeded to do battle with that ancient machine to get decent copies. $40.00 and 60 copies later I had the 10 that I needed. They were turning out the lights as I left. Back in the car, I glanced down at the hastily grabbed, haphazard stack of the most expensive copies ever made. It was still there – the front-page ad with my grandmother’s name. I took a deep breath and pulled out of the parking lot to find Interstate 20 west. It was all okay. After the journey I had just finished, the road to Dallas didn’t seem that long after all. Such a happy, tho exhausting ending. You are an incredible millinery sleuth. So delighted to hear you finally came upon that golden tidbit, on the front page, no less. I shall return to Chicagoland millinery sleuthing fueled by your success. Wonderful! I love that you found her. What a memorable quest, dear Madge. Thanks for sharing it with us.